1965년 광산김씨의 무덤들이 모여있는 광주 무등산 이치(梨峙)에서 김덕령 장군의 묘를 이장할 때 출토된 400년 전의 의복들이다. 김덕령(1567∼1596)은 임진왜란때 담양에서 이름을 떨친 의병장으로 비록 체구는 작지만 민첩하고 능력이 탁월해 왜병장들은 그의 얼굴만 보고도 무서워 철수했다고 한다. 선조 28년(1595) 적장과 내통한다는 억울한 죄를 뒤집어쓰고 체포되어 이듬해 옥사하였다. 영조때 그의 무고함이 밝혀져 병조판서로 추증되었고 광주 의열사에 그의 위패를 모셨다. 출토된 그의 의복에는 조선시대 문무관이 외국에 사신으로 파견되거나, 왕을 호위할 때, 또는 국난시에 입었던 철릭의 여름용과 겨울용 2점, 두루마기와 같은 모습이지만 옷깃이 직선으로 곧아 이름 붙여진 직령포가 춘추용과 겨울용 4점, 그리고 저고리 1점과 바지 1점 으로 그 내용은 다음과 같다. 철릭은 임진왜란 당시 그가 입었던 것으로 위급시에 양팔을 모두 뗄 수 있게 만들었다. 여름옷은 흰모시로 만들었고 겨울용은 두터운 솜을 넣고 누빈 것으로 길이도 여름용보다 더 길게 하여 방한용으로 입었다. 직령포는 흰 무명을 곱게 누빈 춘추용과 솜을 두텁게 두고 누빈 겨울용이 있다. 특히 명주직령포는 삭아서 솜만 남았으나 다른 옷들은 등솔기에서 소매 끝까지의 화장길이가 85㎝인데 비해 129㎝로 길다. 따라서 이것은 생존시에 입었던 옷이 아니라 시신을 입히기 위해 특별히 만든 수의로 보인다. 저고리는 겉은 굵은 면이고 속은 마로 안에 솜을 둔 것이고, 바지는 현재 솜만 남았으나 바지 형체가 뚜렷하게 남아있다. 이 옷들은 16세기말의 것들로 복식사 연구에 매우 귀중한 자료가 되고있다. These 400-year-old clothes were found when the tomb of General Kim Deok-ryeong (1567~ 1596) was moved in 1965 from Ichi of Mudeungsan Mountain in Gwangju where the tombs of Gwangju Kim's family were gathered. A famous brave, patriotic soldier especially in Damyang during the Japanese Invasion of Korea in 1592, he had a rather small physical stature but was astute, with excellent ability; thus, Japanese soldiers ran away as soon as they saw his face. Nonetheless, he was wrongly accused of communicating secretly with the enemy and was arrested in 1595, the 28th year of King Seonjo’s reign, dying in prison the following year. During King Yeongjo’s reign, he was proven innocent and given the title Minister of Defense posthumously. His mortuary tablet is enshrined in Uiyeolsa Shrine, Gwangju. 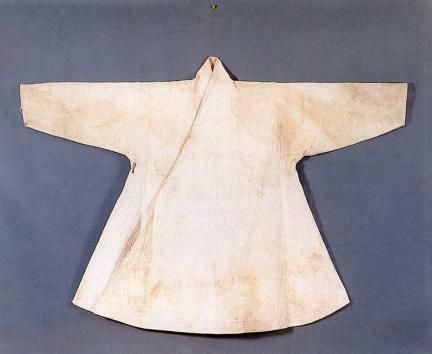 Among his clothes excavated from his grave is cheollik (official robe) worn when civic and military officials were sent to a foreign country as envoys or when they escorted the King during times of national crisis. There are two kinds: one for summer and the other for winter. Jingnyeongpo, which resembles durumagi (Korean topcoat) but has a straight collar, was excavated. Five were excavated: one for the spring and autumn seasons, and the other four for the autumn and winter seasons. Jeogori (jacket) and a pair of trousers were also found. He wore this cheollik during the Japanese Invasion of Korea in 1592. The sleeves were designed to be removed in times of danger. It was made with white hemp for summer and with a padded one for winter. The latter is longer than the former. There are two kinds of jingnyeongpo -- one is for spring and autumn and made of white cotton, and the other is for winter and is made of thick padded quilt. The fabric of jingnyeongpo rotted, so only the cotton wool remains. The length from the seam of the back to the end of the sleeves is 129 cm, which is longer than that of other clothes (85 cm). It seems to have been made especially as a shroud to cover the body. The outer cloth of jeogori is made of thick cotton, and the lining is made of hemp padded with cotton. Only the cotton of the trousers remains, but its shape is recognizable. They are regarded as important materials for studying the history of clothes from the late 16th century.